After 30 years, the first live concert album from Satan and Adam, the Harlem blues duo! 8 CD-quality WAV files. More than 58 minutes of kicking, stomping excitement. The zip file you purchase and download contains liner notes in PDF form. Print, trim, staple, and slide into a CD jewel case, if you want! "Throw down!" is one of the first things the men of Harlem shouted at me when I began playing harmonica with Mr. Satan on 125th Street in the fall of 1986. I had no idea what it meant. No specific idea. But I quickly got the gist. They wanted me to play hard, from deep. They wanted to feel me. And I obliged. "Hell yeah!" they'd yell, after I barked and wailed. "Make it talk! Go, white boy!" They hollered, I played. Call and response. After a few weeks, I'd earned my place with the guitar man. It wasn't until much, much later, preparing a lecture for my blues literature class at the University of Mississippi, that I suddenly realized where that long-ago phrase originated: card playing. The subcultural lingo of the juke joints. Throw down your cards. Which is to say: Show me whatcha got, baby! Time to spread em out on the table. Throw Down! gives you a good sense of what our live show was like back then. We liked to sweat; nobody who didn't would make this sort of music. Ours is a careening, clangy, insanely hard-swinging blues style. None of what we play here was rehearsed or, God forbid, arranged. We forged our improvisational bond by playing these songs again and again in all sorts of weathers and venues; versioning them freshly as the spirit dictated; and joying in our roller-coaster freedom, letting the occasional flubbed note fall by the wayside. A groove and a sound hold everything together. Throw Down! wouldn't exist at all if a professional bootlegger, Bob Siegl, hadn't brought his Teac DAT recorder to Concerts Under the Stars in King of Prussia, Pennsylvania on a warm June evening in 1994 and captured our set. Nor would it have existed if one of our dedicated fans from back then, Zeke Hubbard, hadn't been handed a cassette dub. Twenty years later, when my new duo, The Blues Doctors, was playing a gig at a German social club in western Pennsylvania, Zeke showed up and mentioned the recording. Would I like a copy? That got the ball rolling. Thank you, Bob and Zeke. Sterling Magee turns 79 this month. Alive and reasonably well, retired from active duty, he lives in a Social Security home in Gulfport, Florida. At 57, I'm only a year younger now than he was when he made the brilliant music on this album. I'm making good progress in my own one-man-band odyssey, beating on foot-drums as well as singing and blowing harp, but what's the use of pretending? I listen to the uptempo songs on this album--Cry To Me, for example, or I''ve Got a Woman--and have to shake my head, even more flummoxed now than I was back then. How does he do all that stuff? I'm still chasing the master after all these years. All tracks recorded live by Bob Siegl on June 19, 1994 at Concerts Under the Stars in King of Prussia, PA., using an AKG C522 ENG mic and a Teac DA-P20 portable DAT recorder. Edited and sequenced by Bryan W. Ward at The Tone Room in Oxford, MS. Mastered by Jeffrey Reed at Taproot Audio Design in Oxford, MS. Album cover design by Grant Kessler, Chicago IL. Produced by Adam Gussow. Thanks to Sherrie, Shaun, and Macie. Very special thanks to Frank Migliorelli and RaveOn Records for the old press photo! Adam Gussow is an official endorser for Hohner Harmonicas. ©2015 by Adam Gussow. All rights reserved. Satan and Adam, Throw Down! 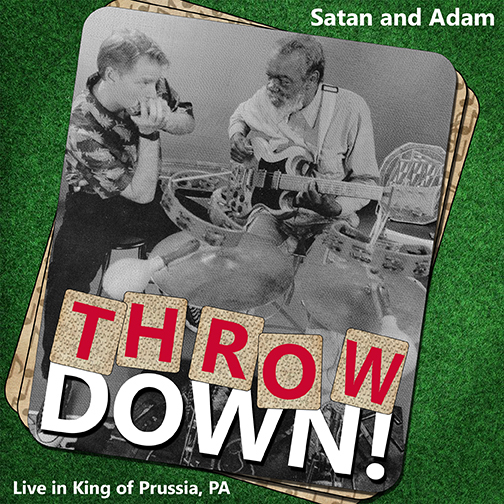 (WAVS) throw down;satan and adam;modern blues harmonica;adam gussow 278323175 10.00 asgussow Fresh Download Available!